This is a great side dish for roast beef, pork, or lamb. It would also be great with any grilled meat. The recipe is adapted from an America's Test Kitchen recipe that included brussels sprouts and excluded the onions. I love the flavor that the caramelized onions add to the potatoes and to the gravy if you make it, so I think they are a must. Adding the brussels sprouts might be nice too if you aren't already serving another green vegetable as a side. Preheat an oven to 350 F.
Combine the potatoes, carrots, and water in a large bowl. Cover and microwave on hi for about 10 minutes. Remove and let cool. Dump out water and season the potatoes and carrots liberally with kosher salt and pepper. 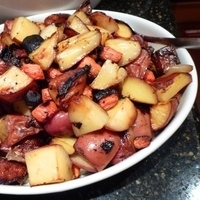 Place the potatoes, carrots and onions in a roasting dish lightly sprayed or rubbed with olive oil. If you are roasting meat, place the onions and as many carrots and potatoes as you can fit loosely around the roast. Do not crowd the meat so much that air cannot circulate around the roast. Place any remaining vegetables in a separate lightly oiled roasting dish next to the roast. Roast the vegetables for a minimum of 45 minutes (and up to 2 hours if cooking with a large roast). Remove and serve. The key trick I took from this recipe was microwaving the carrots and potatoes before roasting them. I found that the outside of the potatoes was less tough, and the inside more tender, than when I have roasted potatoes in the past without microwaving them. Give this technique a try and I think you will be very happy with the result! I agree with John. Simple but very tasty recipe. I wanted him to make mashed potatoes with our prime rib, but he made these instead and they were a huge hit. Loved this! I added the brussels sprouts too cuz I had them on hand. Also added some broccoli near the end. The onions add a lovely flavour to this tried and true recipe. Great work! Glad you enjoyed it Jenefer. Will have to try with broccoli. Nice addition! Make this often but I like to change it up with a few garlic cloves gently smashed or toss in some brussel sprouts (or both!). Thanks for the feedback Jennie. Will try that variation in the future! It looks very tasty and definitely try it! I hope you enjoy it Judit! I like potatoes as side dish. This recipe looks niceeee, I would try this for sure. Thanks for sharing! Clever trick with the microwave. I like making a potato, onion hash, and will try it that way next time. America's Test Kitchen is a great book. I prefer a more savory version without the carrots, and using a white onion that isn't as sweet. Great point Dal. If you're cooking this without a roast (which provides the drippings) you need to spray or rub some olive oil in the pan. I'll add that to the directions. Thanks for the catch!